Veronica Darling: On the road! I'm traveling around a bit for work, so thought I'd post my outfits as most of them are handmade by Veronica Darling... yep ... by me. 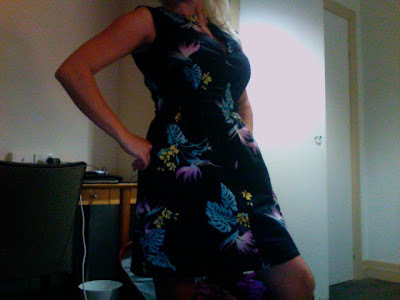 This is a tropical lovely jiffy dress (according to the pattern) I made for my hen's night party... it was great with heels! Today I wore it with my cowboy boots and a side pony. I was REALLY hungover so it was very comfy and slouchy. It's not smocking around the waist, there's four pieces of elastic in casing (which is on the inside) so works in the same way, but heaps easier. Although I've not tried smocking before! I love my baby friends! Wardrobe Refashion - For Life!